Old Cutler Road Charrette Report- the original, uncondensed report. This is the document adopted by Miami-Dade County as guidance for the development and re-development of Old Cutler Road. Old Cutler Road Charrette Recommendations Report- This report lists the prioritized recommendations of the charrette. 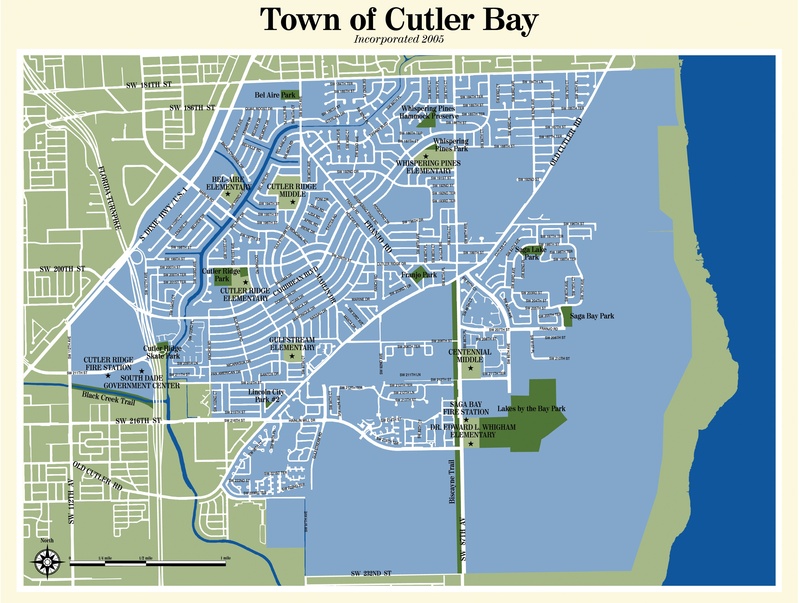 Cutler Bay Growth Management Plan, Vol 1 and Vol 2- This is the Comprehensive Development Master Plan for the Town of Cutler Bay. This plan was approved by the town council in Ordinance 08-06. Florida Law 74-400 Historic OCR- This is a copy of the Florida law that made Old Cutler Road a State Historic Road. Florida Law Ch 2007-041 OCR Curbs and Sidewalks- The state law that allows public funding for curbs and sidewalks on Old Cutler Road. This law was passed because Florida Law 74-400 prohibited such expenditures. Old Cutler Road Charrette Executive Summary- This document was presented, instead of the charrette report itself, when the town considered and approved Ordinance 07-01. Old Cutler Road Charrette Flyer- A one page flyer describing the charrette. Cutler Bay Ordinance 07-01- This is the ordinance, as presented to the council for approval, that implemented the Old Cutler Road Overlay District. Cutler Bay Ordinance 08-04- This is the ordinance , as presented to the Council for approval, that implemented the Planned Urban Development District. Resolution 439-04 MDC Leg Item 033477- This resolution by the County Commission, adopted the Old Cutler Road Charrette Report, and directed staff to implement its recommendations into code. Cutler Bay Code of Ordinances- Section 9-2- Law of Cutler Bay prohibiting alteration of Old Cutler Road from its present character. Study Area F- April 2005- A copy of Miami Dade County's action of denying construction of a shopping center on the "potato field" and their reasons for doing so.